Surround yourself in the comfort of wool with our special Wool Surround package. 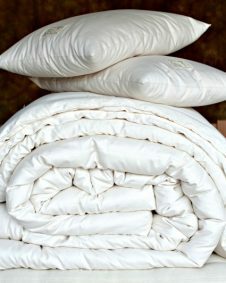 Our Wool Surround includes: a wool topper of your choice, wool filled comforter and sleep pillows, so that you are completely surrounded by the healing qualities of wool! Save 20% on your Wool Surround package and receive free neck pillows! *Free shipping for orders over $200 within the continental US, excluding raw materials and custom orders. Shipping information. Shepherd's Dream is a local, eco-centered small business. 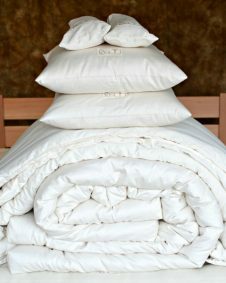 For the last 30+ years, we have handcrafted the best organic wool bedding with 100% natural materials available in our northern California workshop. All of our products are grown and processed in the USA without toxic chemicals or flame retardants. Our wool bed is simple, natural and expertly hand-made. With our extensive research and experience, we believe that a properly maintained wool-filled bed is the most ideal sleep environment available. A wool mattress provides a supportive sleep surface to keep your spine naturally aligned. Sleep better with Shepherd's Dream organic sleep systems. Read all the facts about natural wood bedding and accessories. 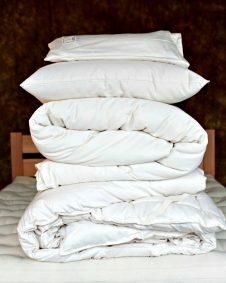 What's the difference between a mattress topper and a mattress pad? Studies show that people sleeping on wool bedding have a lower heart rate, less sleep disturbance and increased duration of beneficial REM sleep. Enter a world of coziness, tranquility and comfort with a Merino wool blanket from Shepherd's Dream. You deserve it! We offer a selection of chemical-free or organic wool mattress toppers handmade in the USA. Buy a natural mattress made from pure materials that offers dreamy comfort and support. Are you allergic to your bed? Shop our non-toxic and eco-friendly mattress. It’s affordable, natural, and 100% free of chemicals. 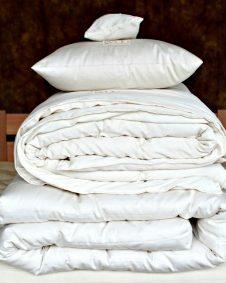 Get the best night's sleep you've ever dreamed of on soft, luxurious organic cotton sheets, comforters, pillows and bedding sets naturally made in the USA.